The breeding males (bucks) can smell pretty ripe during breeding season. Part of their “manliness” is to urinate on themselves to attract the ladies. But we don’t use our bucks for grazing, so you won’t smell them. Bucks have a pretty easy life and “work” for only about 45-60 days a year, making more little weed-eaters. The goats you see out eating weeds are mostly does (girls… pronounced “doughs”). If the season is right, we’ll bring the goat babies (kids) to the job. Our kids don’t go to work until they’re fit to travel, usually when they’re a month old. Goats aren’t real picky. But there are a few things goats just don’t go for, like cactus, tumble weed (once it has thorns), stinging nettle, medusa head, and foxtails (once they grow those microscopic barbs dog owners know all about). In our experience, these are about the only plants goats won’t eat. For a list of the weeds our goats will gobble right down, see “What’s on the Menu.” One of the reasons we like to come visit property beforehand is to find out what kinds of weeds you have. As long as the weeds you have are weeds our goats like to graze on, we’re good to go. Is there always someone watching over the goats? Depending on a few factors, our guard dogs will watch the goats all the time. If your property is in a high traffic area or in the middle of town, we will be checking them multiple times a day. If the property is in a remote area, we’ll check the goats at least once a day. You are not responsible for the goats unless special arrangements are made with us before we start the job. Our goats are our livelihood. We make sure that our ladies are well taken care of and safe. What if we want to pet your goats? Petting our goats is not a problem—as long as we’re there with you. Our big concern is that you don’t touch our electrified fences. They look pretty lightweight, but they can deliver quite a shock. I have other farm animals. Will that be a problem? Not usually. For the most part we will keep the animals separated by electric fences so they don’t come into contact with one another. Why is there a dog with the goats? Our specially trained dogs live with the goats year around. They’re there to protect the goats and to help us move the goats from one area to the next. If you hear them barking, it’s usually for one of three reasons. The first is if the goats don’t go what the dogs tell them to go. The second is if a predator gets in with the goats (poor predator). The third is when they get up close to people they don’t know. In that case, all they’ll do is bark. We train our dogs not to be aggressive towards people. Can I purchase goat meat from you? We do not sell for meat at this time. Yes, of course. We treat our goats like royalty. They’re our bread and butter, so we work hard to keep them safe and happy. 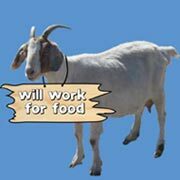 What are the long-term benefits to using goats? When goats graze noxious weeds, they reduce the viable seeds that would otherwise reproduce year after year. And the fewer weeds there are the more desirable plants are able to thrive. If you want to improve your land, you might consider spreading pasture seed and let the goats’ hooves push the seeds into the soil. With annual visits to your property, we can help you achieve your acreage objectives. We leave the milking to the baby goats so they can grow big and strong.